Phenomenally good lecture which develops ideas around bio-politics in general but also has references to all kinds of relevant ideas for me at this stage of my PhD. So this is my current book pile, sort of at the start of things. 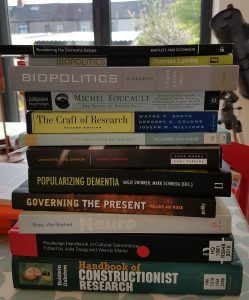 Some oldies (The Craft of Research and Neuro in particular), some library books, looking at some of new possibilities at this point. Dementia, biopolitics, Foucault, methods, all jumbled up.